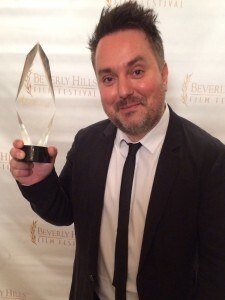 Australian-made dark thriller, ONE EYED GIRL has won the Audience Choice award for Best Film at the 2015 Annual Beverly Hills Film Festival, adding to its growing list of accolades, including Best Film in the Dark Matters Category at Austin Film Festival and Jury Award at this year’s Austin Film Festival in the Dark Matters category. Coming up for its second week in selected cinemas in Sydney, Melbourne and Adelaide, ONE EYED GIRL will soon be seen in Hobart and Darwin (dates and cinemas to be advised). ONE EYED GIRL – written by Nick Matthews and Craig Behenna and directed by Nick Matthews – is a gripping story about a psychiatrist, haunted by the death of a former patient, who stumbles upon a Doomsday cult and battles to save a teenage girl from its clutches. Starring Tilda Cobham-Hervey (52 Tuesdays), Mark Leonard Winter (Healing, Van Diemen’s Land) and Steve Le Marquand (Rake, Vertical Limit), ONE EYED GIRL is distributed in Australia by The Backlot Films. Filmmakers and actors will travel to each city, attending Q&A screenings and will be available for media interviews. Hollywood Reporter described it as “This engrossing, darkly tinged drama is an auspicious debut”; Austin’s The Examiner said, “Winner of the Austin Film Festival (AFF) Dark Matters Best Picture Jury Award, “One Eyed Girl” is an impeccable entry from Australia and the cream of the crop of this year’s festival across all categories.” And Australian cinema goers will have the chance to see ONE EYED GIRL when it releases on April 30. ONE EYED GIRL is a dark thriller about Travis (Mark Leonard Winter), a young psychiatrist haunted by the death of a patient. On the brink of a nervous breakdown, he meets a teenage girl named Grace (Tilda Cobham-Hervery) who invites him to a secret church run by charismatic leader, Father Jay (Steve Le Marquand). In search of answers, Travis is led deeper and deeper into the hidden world of an isolated cult, where he’s given one last chance at redemption. 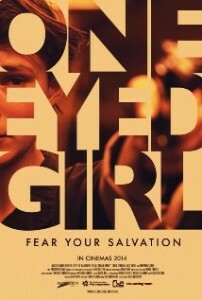 ONE EYED GIRL is the debut feature film from writer/director Nick Matthews, who teamed with long time collaborators, first time producer/editor David Ngo and writer/actor Craig Behenna. In December 2014, cinematographer Jody Muston won Silver at the Australian Cinematographers Society awards for her haunting cinematography on this film. A group of young Australian filmmakers is celebrating after their film, ONE EYED GIRL won the Jury Award at this year’s Austin Film Festival in the Dark Matters category. The South Australian psychological thriller is the second feature film to take out the Dark Matters Award, after it was introduced to the AFF program last year. Now in its 21st year, the Austin Film Festival is known for its focus on screenplays with strong storytelling. Starring Tilda Cobham-Hervey (52 Tuesdays), Mark Leonard Winter (Healing, Van Diemen’s Land) and Steve Le Marquand (Rake, Vertical Limit), ONE EYED GIRL will be released in Australian cinemas on April 2, 2015, distributed by The Backlot Films. Attending Austin Film Festival on behalf of ONE EYED GIRL are producer David Ngo, writer/director Nick Matthews, writer Craig Behenna and actor Tilda Cobham-Hervey, who has been touted by Variety and Vogue magazines as one of the Top 5 ones to watch.